In Episode 67 of The Wendel Forum (originally aired on June 23, 2012, on 960 KNEW AM radio), show moderator Bill Acevedo, chair of Wendel Rosen’s sustainable business practice group, welcomes Lars Jacobsen, co-founder of Stalk Bicycles, which produces handmade bamboo bicycles. 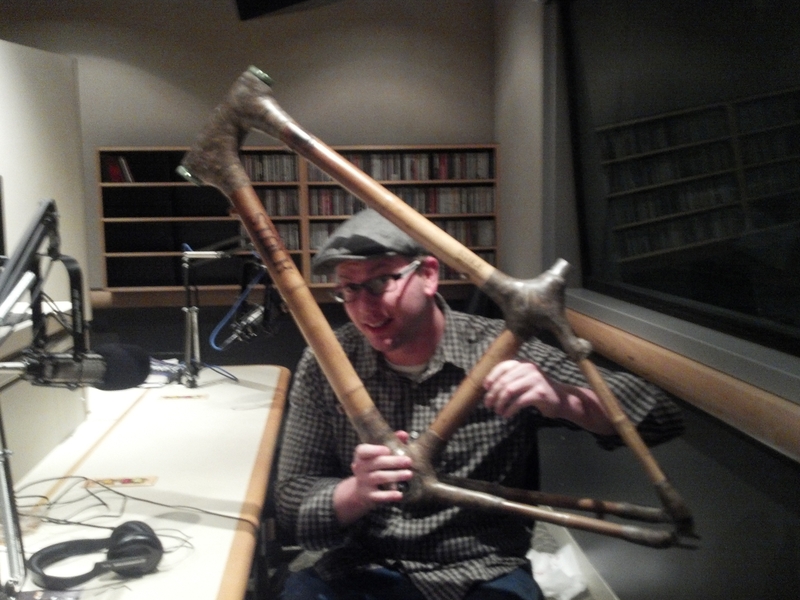 Lars Jacobsen of Stalk Bicycles shows off bamboo framing in The Wendel Forum studio. The fastest growing plant on earth, bamboo is considered by many in the U.S. as a pesky weed, but it is also a surprisingly versatile sustainable material. It has a finished exterior and the grain allows it to bend, but it is still remarkably strong. In some countries, for instance, it’s used as a substitute for rebar! As for its use in bicycles, bamboo boasts a “supreme vibration dampening quality,” making it comfortable to ride. Stalk Bicycle’s bamboo bikes ride beautifully, explains Jacobsen, who spent two years empirically testing the bikes, riding down stairs and along the pock-marked roads of Oakland to assess product quality. The base model, which takes more than 40 hours to custom construct and weighs about the same as an aluminum bike, costs $2,500 and comes with a three-year warranty on the frame. To increase its commitment to sustainability, Stalk uses other natural fibers, such as hemp, for its products and sources as many materials locally as possible. In fact, another Wendel Forum guest, Entropy Resins (Episode 47, Shaping a Superior Surfboard), is a supplier of the resin that Stalk uses on the joints of its bike frames. According to Jacobsen, market acceptance in bamboo bikes is increasing. “When people ride them, the bikes sell themselves.” In addition to direct customer feedback, Stalk has earned support from Northern California’s local artisan movement as well as the cycling community. Would you consider purchasing a bamboo bike?